Woke up yesterday, looked out of the window to find about 60 sailing dinghies out in the Firth of Forth. Did a little googling and I think it was a race as part of the East Coast Sailing Week which was running from the Royal Forth Yacht Club at Granton Harbour. The boats looked fantastic, especially when they had their spinnakers up. James and I dashed down to the end of the pier to try to get some good photos of them. 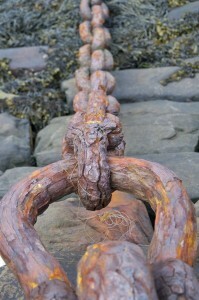 The photos of the boats were okay but I prefer this one of a rusty old chain on the pier. Love the photos. The long narrow sea view with the sailing boats is a bit like the street scenes in the pictures in the art shop in Stockbridge. Have you thought about producing a few and framing them to see if they sell? You could do a selection called off the tourist trail. Good idea! Trouble with that particular image is that the quality isn’t too good because it is zoomed in to the max and then cropped.